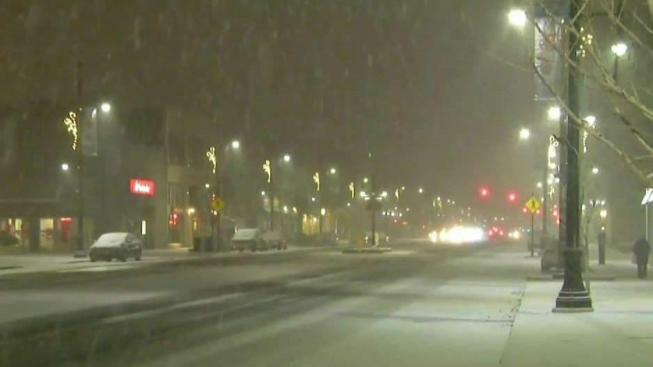 Communities across New England dealt with heavy snowfall Thursday night. Snow flew off hardware store shelves ahead of the season's first significant snowfall — but so did leaf bags and rakes, as fall and winter collided in a pre-Thanksgiving snowstorm, leaving people scrambling to scoop up piles of leaves. "It's supposed to snow tomorrow, so I've got to get it done quick," said Kenneth Oppong of Worcester, Massachusetts. "They're a little bit frantic trying to do two things, get ready for fall leaf pickup, but also buy shovels and ice melters, so it's a little bit weird timing, I think, for people," said Grafton Square True Value Hardware manager Eric Spencer. It's tricky timing for the Worcester Department of Public Works, too, with leaves piled next to city street curbs that could soon be covered in snow, slush and ice. 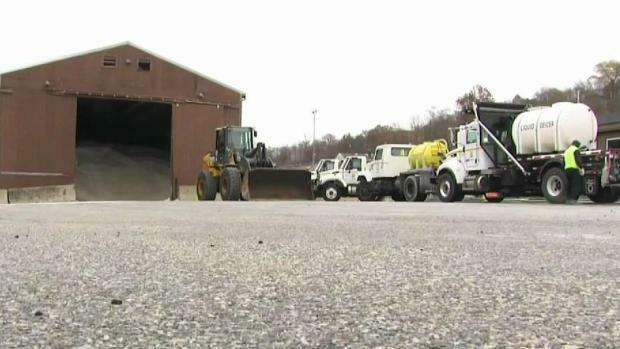 Five weeks before the official start of winter, New England is preparing for a snowstorm. "The leaves are still in areas where we haven't picked them up, so our hope is that this snow will go by and it will melt, and in a couple days, we can get back to finishing picking up leaves," said Worcester Public Works Commissioner Paul Moosey. The Massachusetts Department of Transportation said Thursday evening that it had 994 pieces of equipment out treating and plowing roads. Northwest of Worcester, at Mount Wachusett, crews were in midseason form Thursday night. MassDOT crews had their hands full as the snow got heavy quickly. "Ten minutes ago, it was nothing on the ground, a little bit of sleet. Go into the store, come out, it's all over the ground, building up," one worker said. The snow gearing up reminded people in Newton that they needed the proper winter gear. "I've been delaying buying a coat and I came in here and found a deal that I like," Jose Espinosa of Boston's Jamaica Plain neighborhood said outside a shopping plaza. "I'm going to buy gloves," said Charbel Abdul of Boston's West Roxbury neighborhood. "I've been wanting to do it, but yes, the snow motivated me, because I don't know, tomorrow, cleaning off my car, what it's going to look like." Rhode Island State Police reported that snow-covered roads resulted in 35 weather-related crashes between 6 p.m. and 9 p.m. Multiple vehicles were involved in some of the crashes, but there were no serious injuries reported. For some, this snow is more than just a minor inconvenience. "I'm in a pretty special circumstance with my crutches, so I think the main thing is going to be figuring out how I'm going to go up and down the hill," said Harsh Rana. "It's our first year with snow and a baby, so we'll see," Yanet Ramirez of Worcester added. But for others, this is just part of living in New England. "Every winter, we go through this," a woman named Nancy from Worcester said. "I don't understand why people panic, it's nothing. It's snow!" Worcester Public Schools will have a 2-hour delay Friday and will decide by 5:30 a.m. whether to cancel school. A parking ban is in effect in the city, as well.